NOKIOS is a Norwegian Conference for eGovernment. The venue is Clarion Hotel & Congress, 23 – 25 October 2018, Trondheim, Norway. 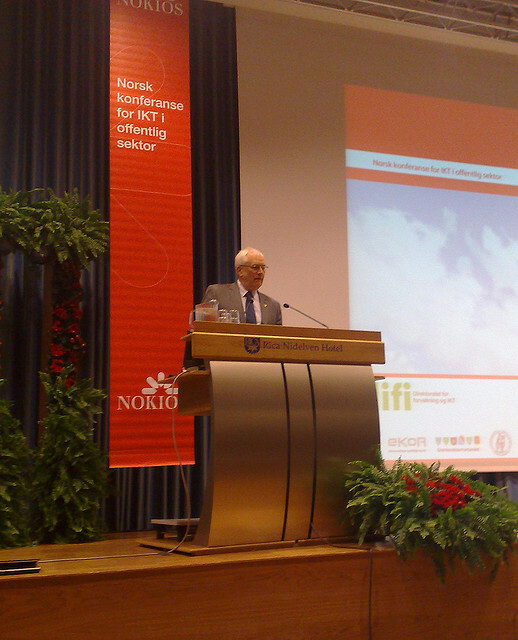 NOKIOS is an annual conference initiated by the Norwegian University of Science and Technology (NTNU) in 2006. The conference is now organized by NTNU in cooperation with vendors and governmental and local agencies. The 12. annual conference will be arranged in Trondheim on 23 – 25 October – expecting approximately 800 people attending the event. The target groups for the event are decision makers from the Norwegian public sector, politicians, managers, project leaders, vendors, IT professionals, researchers and other stakeholders working in the public sector. The aim of the conference is to create a meeting place for a broad range of employees and politicians, researchers, vendors and other stakeholders in the public sector where they can get significant news about digital trends that can help them with their work. The conference features presentations, lectures and news from researchers and vendors. Structure: The conference extends over three days. We start with a wide range of Courses and Workshops on Tuesday 23 October, and carry on with two days of Conference with Plenary sessions, Parallel sessions and Vendors sessions. There will be three parallel concurrent sessions divided into thematic areas. The conference receives financial support from the Research Council of Norway, and has the Agency for Public Management and eGovernment as a collaborator. The conference committee is composed of representatives from different public agencies and vendors in the public sector, chaired by NTNU Professor John Krogstie.